The Barnett's Fort Historical Marker is located near Linglestown Pennsylvania at the intersection of route 39 and Pikestown Road. There is a little pull-over place where you can pull over (safely) on the side of the road. I was able to easily get out of my car, walk right up to the historical marker and photograph it. North at the head of Beaver Creek, Joseph Barnett's loghouse was a frontier refuge in 1756-63 against Indians raiding the frontier. His son William was stolen by Indians in 1756 and not recovered until 1763 by Col. Henry Bouquet. I don't believe the log house exists any more as I didn't see it, nor any remains of it. I think this historical marker is just there to document the past history about it. It's located right near a wooded area with some residential houses nearby. You can easily find it if you want to document it, but other than the historical marker, we didn't see anything else to go along with it. 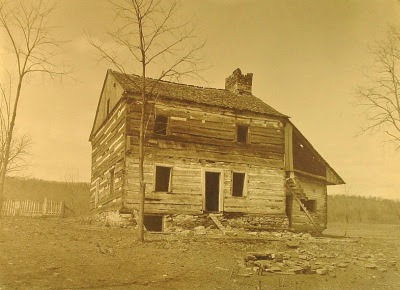 We did find some historical information about Barnett's Fort and his House online that's courtesy of the Historical Society of Dauphin County. I highly recommend that you visit their website if you want to read the story and to learn the history about it. It's a very interesting read and puts the historical marker information into proper context. I am glad that you have been photographing these historical markers. I wonder how his son adjusted to living with the Indians.